Selected 13th overall in the 2018 NLL Draft. 1. Tell us about your lacrosse career so far. I started playing indoor lacrosse at seven. I was lucky enough to get drafted to the Delta Islanders for my first year of junior. I grew up playing for Langley so moving towns was different for me, but it was a great team to get drafted to. We missed playoffs our first year, made it the second year and lost, and in my last year of junior we finally beat the Coquitlam Adanacs, who hadn’t lost in eight years – we finally beat them to win the BCJALL Championship. 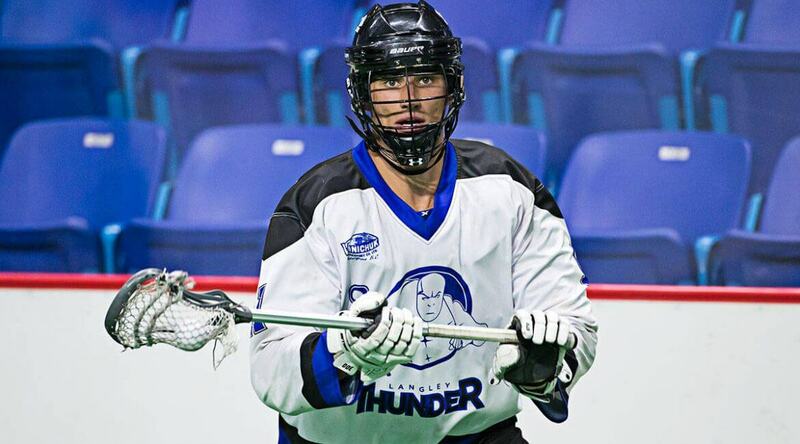 I then got drafted from there to play for the Langley Thunder two years ago, and I’ve been playing in the WLA since. 2. Do you play any other sports? I tried to play everything really. In school I was always playing whatever sport I could get my hands on. I picked up field lacrosse around 13 which kind of kept me busy year round along with my indoor game. And then when I got to high school I played on every men’s team: basketball track, soccer, badminton, I played on every team we had for something to do. I feel like that helped make me a better athlete, if I only ever played the same sport in the exact same ways I wouldn’t be as well-rounded as I am. 3. What are you most excited for in the NLL? I’m excited to see where my game can go. They always say when you’re around better players you become a better player, so I cannot wait to get on this team and be playing with guys I’ve watched my entire life. Some of the best players in the entire world are on the Roughnecks, so I can only imagine where my game is going to go being around players that take it so seriously, and make it their lifestyle. 5. Who did you base your play off of/ look up to? John Grant Jr. is a living highlight reel. When Peterborough won the Mann Cup when I was a kid, they won it in Coquitlam so I actually met him. As a kid, it was like meeting Wayne Gretzky because he was that big of a guy in my world. That was the big spark for me to want to pursue the indoor game, and continue and try to get to the professional level; watching them win that championship was the fuel for me. As far as the outdoor game goes, in college I looked up to Paul Rabil. I started my college career as a midfielder, and he spent his entire career as a midfielder. But then I switched to attack and other players became more apparent for me to start watching, like Rob Pannell, because I started playing a different position which I wasn’t familiar with. 6. What’s been your favourite experience in lacrosse so far? I’ve been pretty blessed to have been on some very successful teams. Indoor wise, it would have been my last year of junior when the Islanders finally beat Coquitlam. We played a three-game series and we won it, I think the final game we won in overtime and a defensive guy scored the goal – it’s just one of those moments I’ll never forget. Just last year, my school finally made it to the NCAA national tournament, which was like a very big deal, and we have some extremely significant victories last season. We played the No.-3 team in the nation at the time and we beat them at home; we had to fly to North Carolina and it was a big thing for our school since our program was only about eight years old. Winning there was probably one of the most significant moments for me in lacrosse. 7. If you could have dinner with anybody, who would it be and why? I think Derek Jeter from the Yankees. When I was a little kid I wore No. 2 because of him. Watching him with the Yankees, seeing the way he conducted himself in his social life and on the field, he was just the perfect role model. I have watched my son Reece grow as a lacrosse player and a person. I could not be more proud of him. Reece is a huge impact player and he will make Calgary a stronger team.